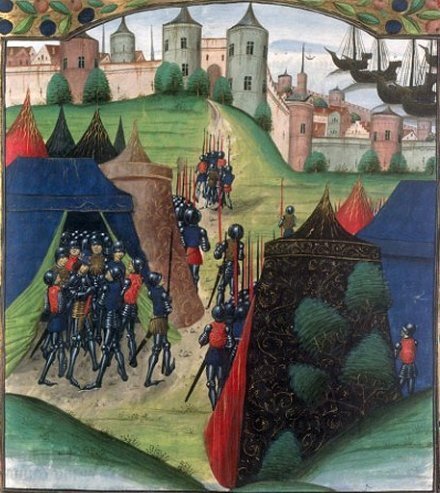 On this date in 1347, the city of Calais yielded to an English siege. Edward III had proceeded to invest Calais directly after the previous year’s staggering win at Crecy. The crippled French leadership could not relieve the city, and after fruitlessly probing for an opening, the relief army marched away at the start of August 1347. By this time reduced to eating vermin and ordure, the starved city had little choice but to capitulate. According to Froissart’s account, the king declared that “the Calesians have done him so much mischief, and have, by their obstinate defence, cost him so many lives and so much money, that he is mightily enraged.” He wasn’t only sore about the city’s holding out over the preceding year: Calais was notorious as a refuge for English Channel pirates who had long bedeviled the commerce of Edward’s realm. This information caused the greatest lamentations and despair [in Calais]; so that the hardest heart would have had compassion on them; even the lord de Vienne wept bitterly. After a short time, the most wealthy citizen of the town, by name Eustace de St. Pierre, rose up and said: “Gentlemen, both high and low, it would be a very great pity to suffer so many people to die through famine, if any means could be found to prevent it; and it would be highly meritorious in the eyes of our Saviour, if such misery could be averted. I have such faith and trust in finding grace before God, if I die to save my townsmen, that I name myself as first of the six.” When Eustace had done speaking, they all rose up and almost worshipped him: many cast themselves at his feet with tears and groans Another citizen, very rich and respected, rose up and said, he would be the second to his companion, Eustace; his name was John Daire. After him, James Wisant, who was very rich in merchandise and lands, offered himself, as companion to his two cousins; as did Peter Wisant, his brother. Two others then named themselves, which completed the number demanded by the king of England. Wealthy elites sacrificing themselves for the greater good? The past really is a different country. The king looked at her for some time in silence, and then said; “Ah, lady, I wish you had been anywhere else than here: you have entreated in such a manner that I cannot refuse you; I therefore give them to you, to do as you please with them.” The queen conducted the six citizens to her apartments, and had the halters taken from round their necks, after which she new clothed them, and served them with a plentiful dinner: she then presented each with six nobles, and had them escorted out of the camp in safety. Edward still had the last laugh when it came to Calesian carnage. The Six Burghers persisted even longer than that. George Bernard Shaw wrote a one-act play standing the story on its head, in which a henpecked Edward exasperatedly yields to his nagging wife’s merciful caprice, to the open derision of the burghers themselves. 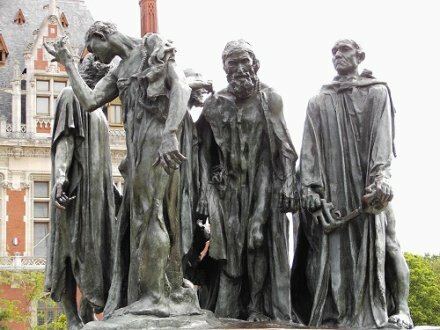 A bit more exalted of spirited is Rodin‘s sculpture group Les Bourgeois de Calais — rendering six emaciated, suffering, and courageous figures. I have, as it were, threaded them one behind the other, because in the indecision of the last inner combat which ensues, between their devotion to their cause and their fear of dying, each of them is isolated in front of his conscience. They are still questioning themselves to know if they have the strength to accomplish the supreme sacrifice–their soul pushes them onward, but their feet refuse to walk. They drag themselves along painfully, as much because of the feebleness to which famine has reduced them as because of the terrifying nature of the sacrifice … And certainly, if I have succeeded in showing how much the body, weakened by the most cruel sufferings, still holds on to life, how much power it still has over the spirit that is consumed with bravery, I can congratulate myself on not having remained beneath the noble theme I dealt with.